In this release, we have extended existing feature edge handling, reported previously and have also implemented a new method for handling feature edges. In the existing method, the user typically extracts feature edges from the geometry surface using the surfaceFeatureExtract utility and then explicitly specifies the features through the features entry in the snappyHexMeshDict file. 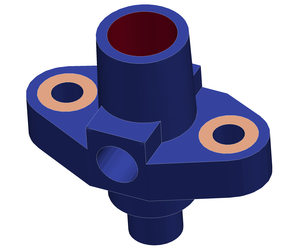 The method attracts points on the mesh boundary onto nearest points of the supplied feature edge. The new implicit method does not require the user to extract features. Instead, it uses the resolveFeatureAngle keyword entry to identify surface geometric features, e.g. creases in the geometry. Rather than snapping directly to an edge geometry, as supplied explicitly in the previous method, the implicit method snaps to a representation of the feature, calculated from local surface topology. The existing explicit method has been extended to handle snapping features that represent the intersection between boundary patches, even if the patches are in the same plane, i.e. along a flat surface. This is illustrated below where the right image is of a mesh generated with the latest version of snappyHexMesh, compared to the previous version in the left image. The explicit method offers greater control and, from our experience, provides slightly better feature conformation. The implicit method has the advantage of being fully automated. 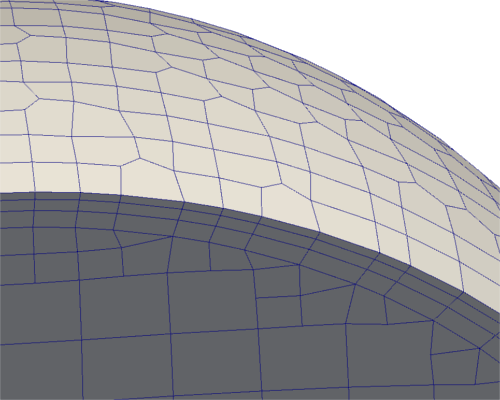 During the layer addition process in previous versions of OpenFOAM, vertices on boundaries were fixed. If a user chose to add layers of cells to a given patch, the layers would pinch at the outer edge of the patch. In the latest version, vertices can slide along a boundary, allowing the layers to be created without pinching. Improvements have been made to the detection of medial surfaces that are used for mesh shrinking during the layer addition process. This results in better layer addition, in particular in narrow regions of a domain, as shown in the figures below. The top image shows layers from a mesh generated with version 2.1.0, the bottom image is the new improved mesh using version 2.2.0. New controls have been added where the user can specify the thickness of the first layer and the entire layer region, using the keywords firstLayerThickness and thickness respectively. Recent versions of snappyHexMesh can conform internal faces to an internal surface geometry, by specifying a faceZone in refinementSurfaces in the configuration of snappyHexMeshDict. The faces on the internal surface become a set of internal faces under the name of the specified faceZone. In the previous version, refinement at features was limited to a single refinement level attributed to cells intersected by the feature. In the latest version, users can specify levels of refinement based on distance to a feature. 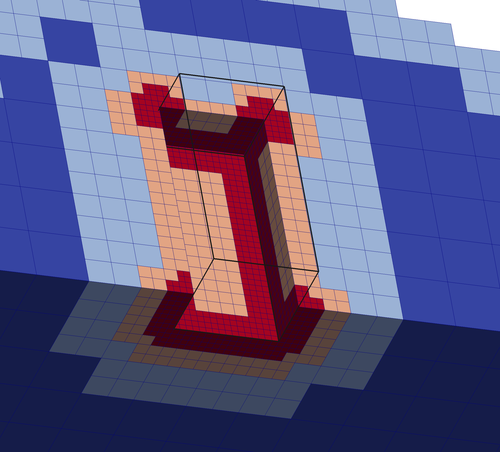 The following example shows how level 2 refinement can be specified at the feature edges, with level 1 refinement at a distance within 0.33 m from the feature edge. snappyHexMesh can be run using a -checkGeometry option, which will check all defined geometry for overlaps and intersections. Intersection lines are output as .vtk files.